All manual sales are final - no returns will be accepted. 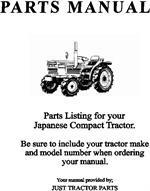 PARTS MANUALS AVAILABLE $49.95 plus s&h TRACTOR MODEL with/ENGINE # when available. Please note that many of these manuals are with TEXT IN JAPANESE. This is indicated with an (J) by the model number. All others have the TEXT IN ENGLISH and are indicated with an (E) next to the model number. Unfortunately, we can't put everything we sell on our website, so if you don't see something you need, please give us a call!